Beef dripping makes the best tasting pastry. 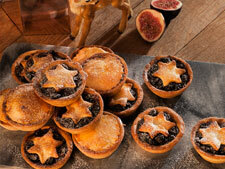 Try it yourself with this great recipe for mince pies. To make the pastry: Place butter, cold lard (beef dripping) and sugar in a food processor and blitz until combined add the egg and blitz for a further 30 secs. Add in the flour and pulse for a few secs until just combined, and just starts to come together, add a little water if the dough appears a little dry. Knead the dough gently on a floured surface into a disc and then wrap in cling film and refrigerate for 30 mins. Grate the rind from the lemons on the finest part of the stainless steel grater, squeeze out the juice and stir into the pulp. Grate the rind from the lemons on the finest part of a stainless steel grater, squeeze out the juice and stir into the pulp. Add the other ingredients one by one, and as they are added, mix everything thoroughly. Put into sterilized jars, cover and leave to mature for two weeks before using. This mincemeat will keep for two to three years in a cool, airy place.